The powerful black buffalo travels great distances in life. 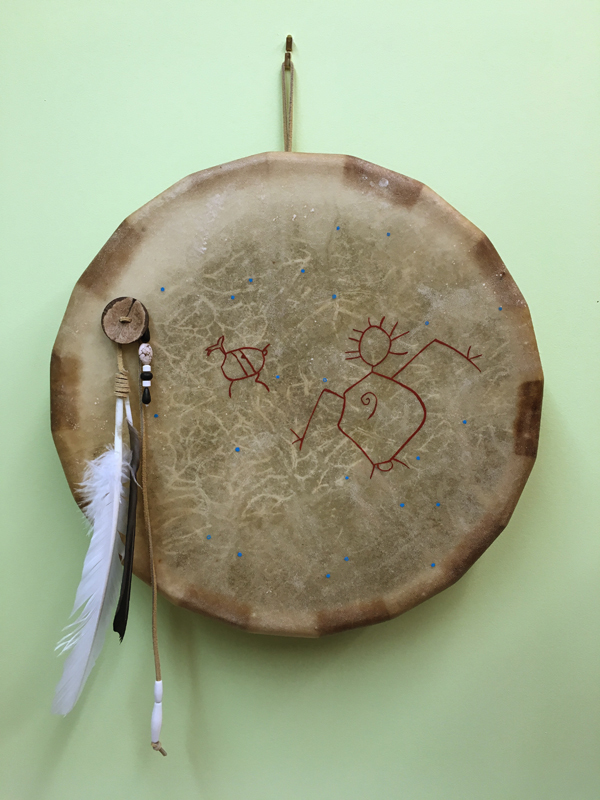 His tracks around the drum stay close to the red world while learning traditions and the medicine from the elders. 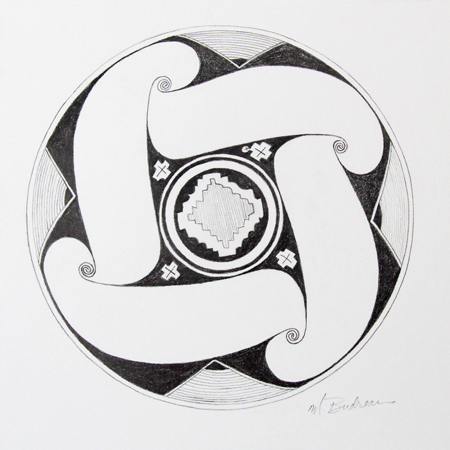 When he arrives at the height of preparedness – the top of the drum – he leaves the known world into the unknown (the stones represent these challenging steps and the feathers are flight power for this transition). He moves beyond the scope of what he has been taught, to a place where he learns for himself, a place where his personal sovereignty emerges and he sees what is true, what is real. All the while supported by the spirit of The People. He becomes authentic and leaves his mark on the world (four foot prints on the rim). 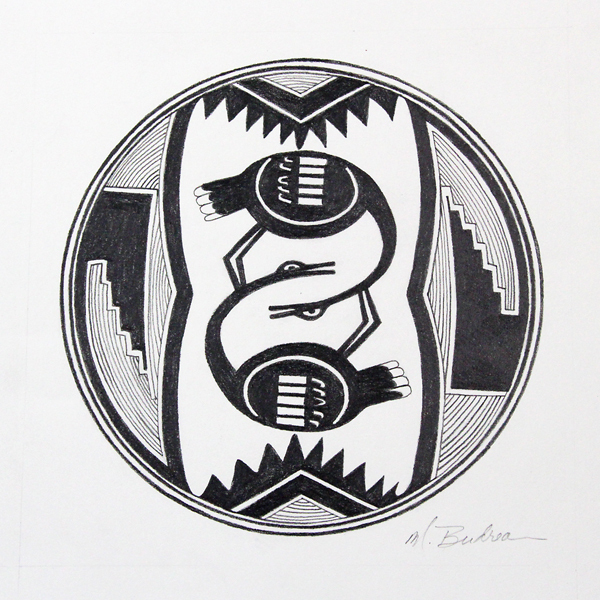 The Mimbres culture is no longer with us. I learned of them through Victorio, his name often has "Mimbres Apache" following it because his branch of the Chiricahua lived in the Mimbres River region of southern New Mexico. Between early 1000 and 1150 they painted complicated geometric designs, and stylized animals and figures mostly on the inside of shallow clay bowls. The images are rich in metaphor, and I connect them to pictographs and petroglyph symbols. 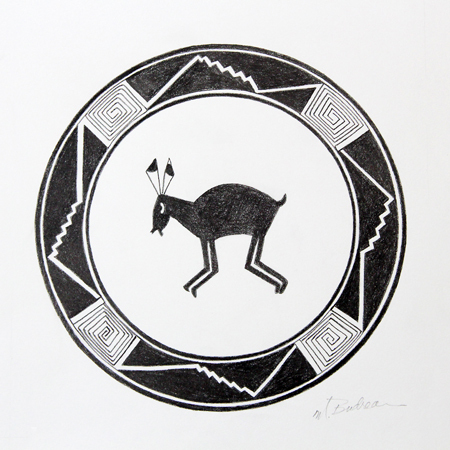 These inspire me to get "into" the designs and hand draw them, just as the Mimbres did. When copying the work of another artist, a rich way to learn, there is discovery of their decisions, it's like putting together a puzzle. The Mimbres used sacred geometry in their designs, the principle of thirds - how did they arrive at this method? I also find an organic flow and tension that also exists in the North West Coast Indigenous art of the Haida and other coastal groups. Small inconsistencies appear in the patterns, for example where there are 4 repeats of a pattern, a closer look reveals there are 5 points in 3 of the patterns, and 4 points in the 4th perhaps saying as the Navajo do in their weavings, that there is no perfection. 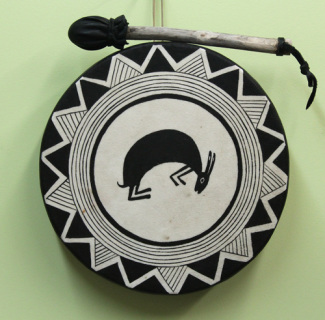 A majority of Mimbres art is black and white on the inside of bowls but some was made in red ochre and some was added to the outside of bowls. Bowl shards were found on the ground in many of their settlements and ruins. Some bowls had holes in the centre and were placed upon the head or face of a deceased person. It is rare to unearth a Mimbres burial without finding a bowl.